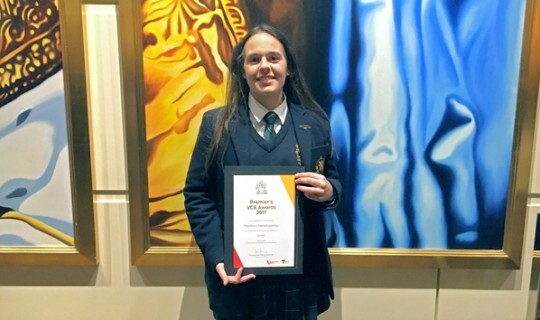 The “Premier's VCE Award” for her outstanding performance at last year’s Greek VCE exams was awarded to Theofano Tsentikopoulos, a student of the School of Language and Culture of the Greek Community of Melbourne (GCM). The awards were presented by the State Minister for Education Mr James Merlino, on Thursday 27 April 2017, in a special event at the Palladium Crown, at Southbank. Theofano and her parents were thrilled with the award. "My award by the Premier of Victoria for my performance at the Modern Greek VCE exams was a unique honour for me," said Theophano. "By meeting today other students who excelled in more than one lesson, it made me decide to intensify my efforts this year to excell in other subjects too. My warmest congratulations to all the students who were awarded today. " Her parents, Nikos and Xenia Tsentikopoulos, expressed their joy for Theofano’s performance, and their gratitude to the staff and the management of the GCM schools: "It is a thrill for a parent to see their child be rewarded for their performance by the Government. The award ceremony highlights the efforts and struggles of the students, the teachers and the parents who support them and guide them on the road to excellence. The parents also congratulated the teaching and managing staff of the GCM schools for the high standard education they offer. “Also congratulations to all students who were awarded, and our wishes for every success in their lives,” they said. It must be noted that Theofano’s outstanding performance is not limited to Modern Greek. Recently, she won an award for “original musical composition” at the 7th International Short Film Student Competition in Greece for the song "Αναμνήσεις παλιές", which she initially composed for the Greek student short film "From the Morning to the Evening”.